Andy Murray defeated Milos Raonic in straight sets to keep his chances of qualifying for the semi-finals of the ATP World Tour Finals alive on Tuesday. The fifth seed claimed his first win over the Canadian in 2014, thereby stopping him from recording his 50th match win of the season 6-3 7-5. It was also Murray’s second win in five meetings with Raonic. Seventh seed Raonic saved 2 break points at 1-2, but was broken two games later by the Briton, who lost nine of his service points in the 37-minute first set. Both players exchanged breaks early in the second set. Raonic’s aggression cost him the match as Murray soaked up the pressure from behind the baseline. The 23-year-old was broken to 15 to gift Murray a shot at match point at 6-5. 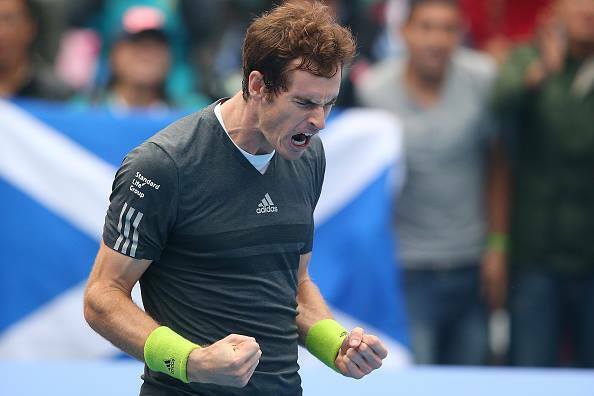 Andy Murray Celebrates After Winning Milos Raonic at the ATP Finals. Image: Getty. Up next for the home favourite is a battle with six-time champion and fan favourite Roger Federer on Thursday in their final round robin match. “It will be obviously a very difficult match,” reckons Murray. “But it will be an exciting match. A good one to be part of. Federer has yet to lose a set in Group B and still has a chance of reclaiming the year-end No. ranking from Novak Djokovic. The Swiss, who has ended a year atop the rankings five times in his career, will have to win the title undefeated and win one live singles rubber in the Davis Cup final- where Swiss are up against France- and hope Djokovic goes 2-1 in the round-robin play phase and does not progress beyond the semi-finals at the O2 Arena in London. 2014 Would Be a Better Year for Nigerian Sports Sector- NOC President. Martins Scores Third Goal in Three Straight Matches.